Product #17288 | SKU GPB-11 | 0.0 (no ratings yet) Thanks for your rating! 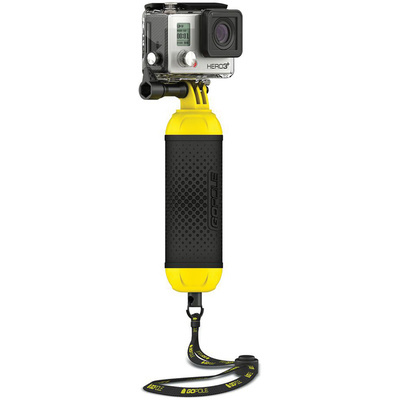 The Bobber Floating Hand Grip for GoPro HERO from GoPole is designed to keep your camera afloat should you lose hold of it in the water and features florescent yellow endcaps to make it easier to spot. To help ensure it doesn't slip away though, the Bobber features a texturised hand-grip as well as a carabiner and wrist strap lanyard. The standard three-prong interface is compatible with most GoPro housings and frames and will allow the camera to tilt. A locking thumbscrew is included.